CRISM is an imaging spectrometer on Mars Reconnaissance Orbiter. It's unusually sharp-eyed for this kind of instrument; imaging spectrometers usually sacrifice spatial resolution (producing less detailed images) for spectral resolution (producing more information on how each image pixel appears in different wavelengths of light). A regular camera may get high spatial resolution, but each pixel may contain information on only one or a handful of different wavelengths of light. CRISM does well both spatially and spectrally, getting medium spatial resolution, while every pixel contains up to 544 different data points across the electromagnetic spectrum. The pictures I showed you above are displaying only three of those data points -- that's barely more than half a percent of the full spectral information you can pull out of the data set. What does that spectral information buy you? For one thing, it can tell you about the surface composition of these moons. 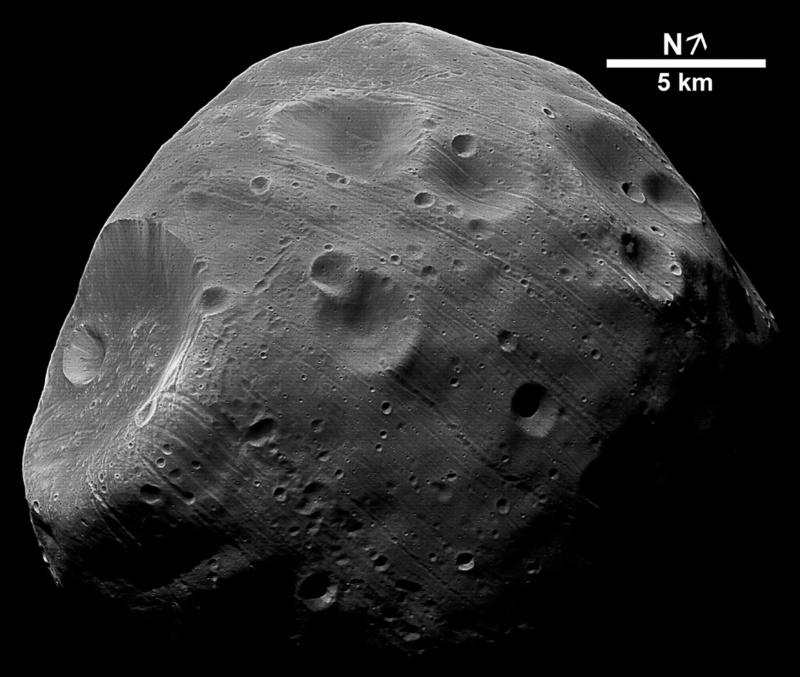 Phobos' surface composition has been studied by other spacecraft, notably the Russian Phobos 2. 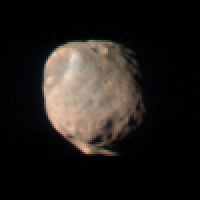 However, this face of Phobos has not been multispectrally imaged before. And Deimos -- the smaller and outer of Mars' two moons -- has never ever been resolved by an instrument capable of spectral mapping. So these data must be exciting to the three scientists who care about Deimos' geology. Actually I'm sure more than three scientists would like to know about Deimos' geology, but it's tough to study a topic without much in the way of useful data; this image suggests that CRISM could help tremendously in advancing that study. Just for comparison's sake, here's one of the best views of Phobos out there, taken by the HRSC camera on Mars Express. This is an example of an image with fantastic spatial resolution -- there is gorgeous detail visible in all of Phobos' little grooves -- but with virtually no spectral information; HRSC samples a wide band across the electromagnetic spectrum and can tell us if some areas are more reflective overall than other areas, but tells us little about the color of Phobos. hobos is likely a captured asteroid and is a tiny object measuring only 27 x 22 x 19 kilometers (17 x 13 x 12 miles) in size. The pixel scale of the enlarged view of this moon is only 7 meters (20 feet), nearly the highest ever achieved; and with the sharp vision of Mars Express' High Resolution Stereo Camera, the details are sharper in this image than in any previous one. The huge crater to the left side is named Stickney. (There is, in fact, a color version of this image here; but I chose the grayscale version because its resolution is much higher.) For completeness, here's the best photo I could dig up of Deimos. To my geologist's eye, it looks substantially less interesting than Phobos. Deimos is the smaller and outer of Mars' two moons, measuring 15 x 12.2 x 11 kilometers, smaller than many asteroids. It orbits Mars at a distance of 20,061 kilometers from the surface every 1.26244 days and because of its small size appears as no more than a bright star from the surface. This photo was taken from one of the Viking orbiters.